ECHINODERMATA : VALVATIDA : Asterinidae STARFISH, SEA URCHINS, ETC. 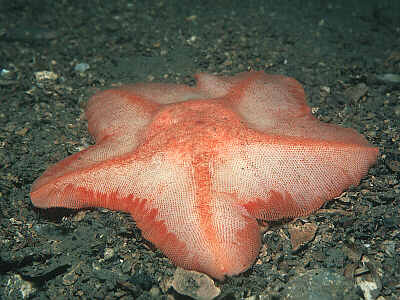 Description: A very thin, leaflike, flat starfish with short webbed arms. The dorsal surface has a granular texture of small plates. The colour is white with five radiating red lines, one down the centre of each arm. The centre of the disc is red and there are red margins to the arms. The red coloration may be more developed in some individuals and may cover most of the dorsal surface. Up to 20cm. across. Habitat: Characteristically found on muddy sand or muddy gravel. Often covers itself with sand or gravel. Apparently feeds on small crustaceans but it is not known how these are caught. Distribution: Found sporadically all round the British Isles, especially in water of 20 - 40m. Locally common but rarely seen by divers. Similar Species: None known at present from shallow water. However a specimen with spotty coloration and longer arms has been photographed in Loch Duich, W. Scotland and may be a different species. White with bright red markings. Picton, B.E. & Morrow, C.C. (2016). Anseropoda placenta (Pennant, 1777). [In] Encyclopedia of Marine Life of Britain and Ireland.